This Thermal Boot Cuffs crochet pattern is brought to you by Mistie Bush from American Crochet. Thank you Mistie for saving the day! The boot cuffs are nice and cozy, thus giving you an excellent layer of warmth. This pattern uses simple stitches, which makes these crochet boot cuffs for suitable for beginners. However, the texture of the fabric comes out absolutely beautiful! Thus, these cuffs will make for a much appreciate gift in the cold weather. The pattern is given in one size only, but in a multiple of 4, you can crochet this to any size you want. Another option is to experiment with different hook and yarn sizes. Here is a crochet boot cuffs size chart. The bootcuffs are worked in the round. Chain 1 does not count as a stitch unless otherwise stated. Adjust the size as you like in a multiple of 4. Join the last row to the 1st row with a series of slip stitches. Rows 3-5: Repeat Row 2 for the pattern. Hi, my name is Mistie. I am the wife of a terrific man who loves me just the way I am and makes me happy. I am the mother of of 5 adorable children who keep me busy and brings me joy regularly. I am blessed and extremely fortunate to be a stay-at-home mom. I started crocheting in 2004 and started designing patterns in 2007. It did not take me long to realize that Crocheting and designing was my passion! 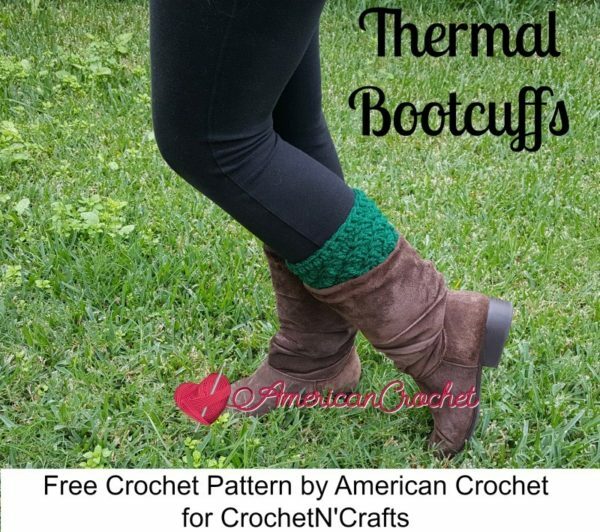 And don’t forget to check out the other patterns by American Crochet, as well as more boot cuffs crochet patterns here on CNC. Hi Dianna, I changed a few settings, so hopefully that will work for you now.